how long do straw bale homes last? Straw bale house walls have been around for centuries. And straw bale houses built in the early 1900s are still standing today. Still occupied and in good condition. 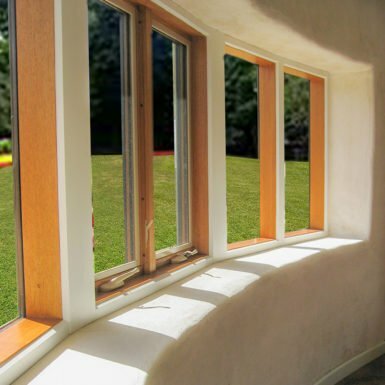 Straw bale houses have a rendered wall finish on the inside and the outside walls. The trick to longevity in a straw bale house is maintenance. And to be aware that you will need to re-apply the render as part of your ongoing maintenance program. 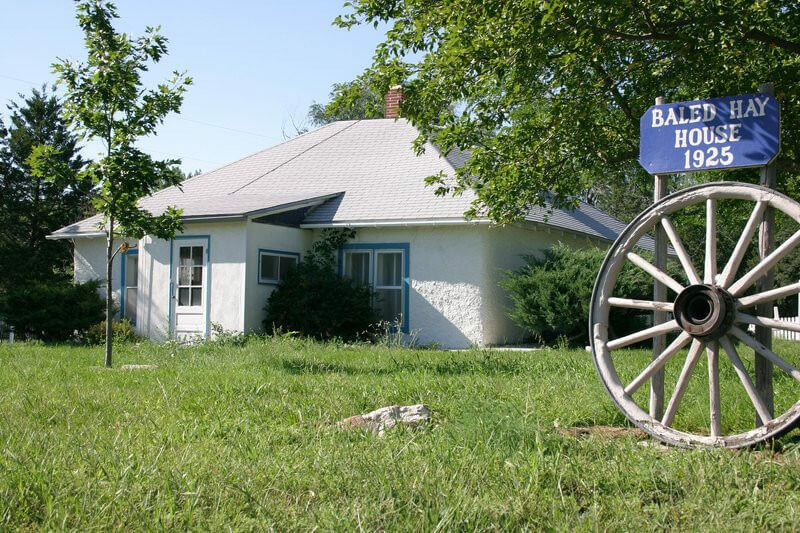 The straw bale house in the image above is built in the traditional ‘Nebraska style’ or with load-bearing walls. It used bales made up of the rushes from a nearby shallow lake. Built in Nebraska, U.S.A., baling up whatever material was at hand was a common practice at the time. Many of the original homes in this area use wild prairie grasses. And a hay press travelled from farm to farm to bale the hay. 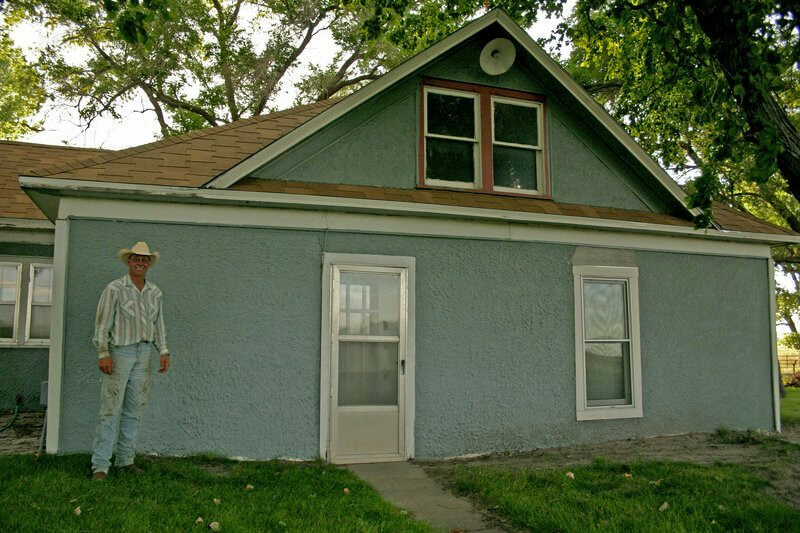 The image above is another of the original Nebraska Straw Bale buildings. There are stories livestock eating un-rendered and exposed straw walls. 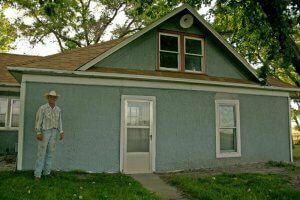 You can read more about this and the original Nebraska Straw Bale buildings here. Straw bale absorbs sound so you can expect a quiet living environment in a straw bale house. are straw bale homes a fire hazard? Fire needs oxygen to burn. When a material burns, it is the reaction between that material and oxygen. And the energy released from this chemical reaction is what we know as fire. Straw will catch fire and burn if set on fire. But when it comes to strawbale houses, this is a different situation. Because each strawbale is tightly compaction, this means that there is little oxygen available for the strawbale to catch fire. The rendered wall finish also helps to reduce the amount of oxygen available. Compacted straw has good fire-resistance because of the density of the packed straw. Now, this all sounds reasonable, but there is nothing like a picture to tell a thousand words. 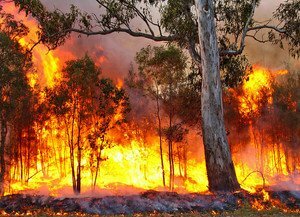 The CSIRO tested a house made from strawbales clad with a Magnesium Oxide fire resistant board. You can see the CSIRO’s fire test here. The fire emulated a bushfire with temperatures reaching 1000 ° C. Inside the strawbale test house temperatures reached a relatively cool 35 ° C.
Another fires test in the U.S.A. completed an analysis on lime cement plastered strawbale wall. The highest temperature rise measured during this test recorded 100°F or 38°C. Inside the wall surface of the strawbale walls remained unburnt. And the outside surface of the strawbales charring during the test. You can watch this U.S.A. fire test on the strawbale wall here. Is straw a good Insulator? If so, why is straw a good insulator? Strawbale house construction can be of two types. You can use bales of straw for the house structure as load bearing walls. Or strawbale house construction can use strawbales for infill walls. In this case, there is a separate house frame structure. The term straw refers to the stalk, usually a waste product of wheat. The strawbale could be wheat bales, or rice, rye or oat bales. The bundles need to be well compacted. They are denser than the standard strawbale that you might see in a farm shed. To know how well a building material is for insulation you look at its R-value. The R-value will tell you how much heat or cold will transfer through the building material. A low R-value indicates a poor insulating material. And a high R-value provides excellent insulation. For example, a single pane of glass is a poor insulator, with an R-value of R0.9. And as a way of comparison, a double-glazed window can have a high rating of R5.0. 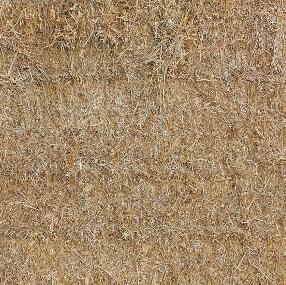 Straw bales have high R-values which make straw bale an excellent insulating material. The R-value for straw bales is around R5.5. So why is straw such a good insulator? Straw is a cellulose material that is a poor thermal conductor of heat, unlike metal which is an excellent thermal conductor of heat. So if you put a metal spoon in hot water, it will heat up quickly. And conversely, if you place a metal spoon it in cold water, the metal spoon will be cold to the touch — not the same with straw. 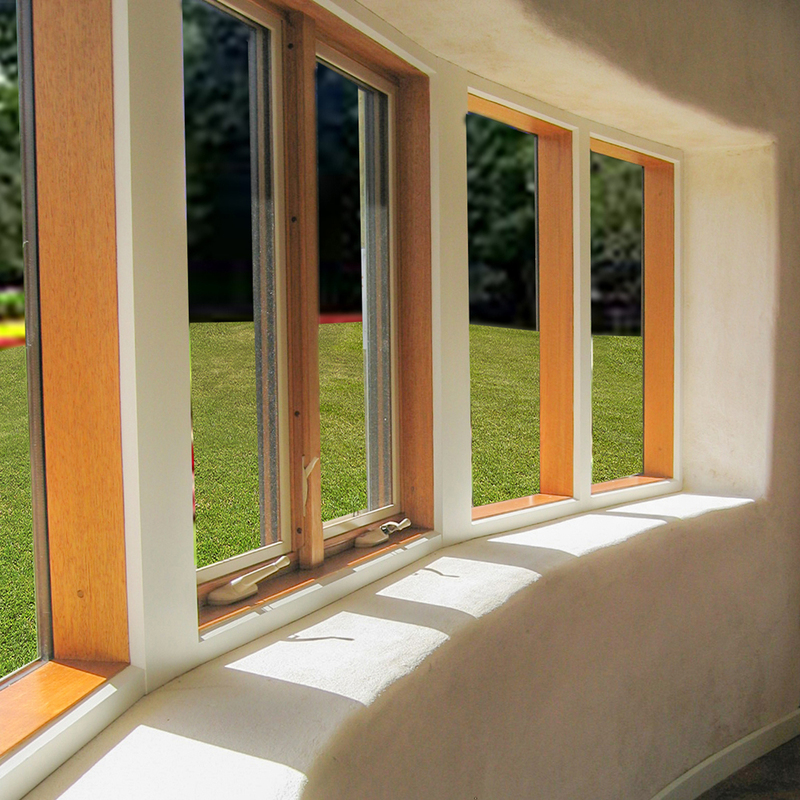 Within the strawbale, there are pockets of air. Which also increases the insulation properties of the strawbale. Along with the thickness and volume of straw in a straw bale. The amount of hay is why strawbales have high R-values or excellent insulation properties. Located on 5.3-hectare farmlands site in East Gippsland, Victoria. 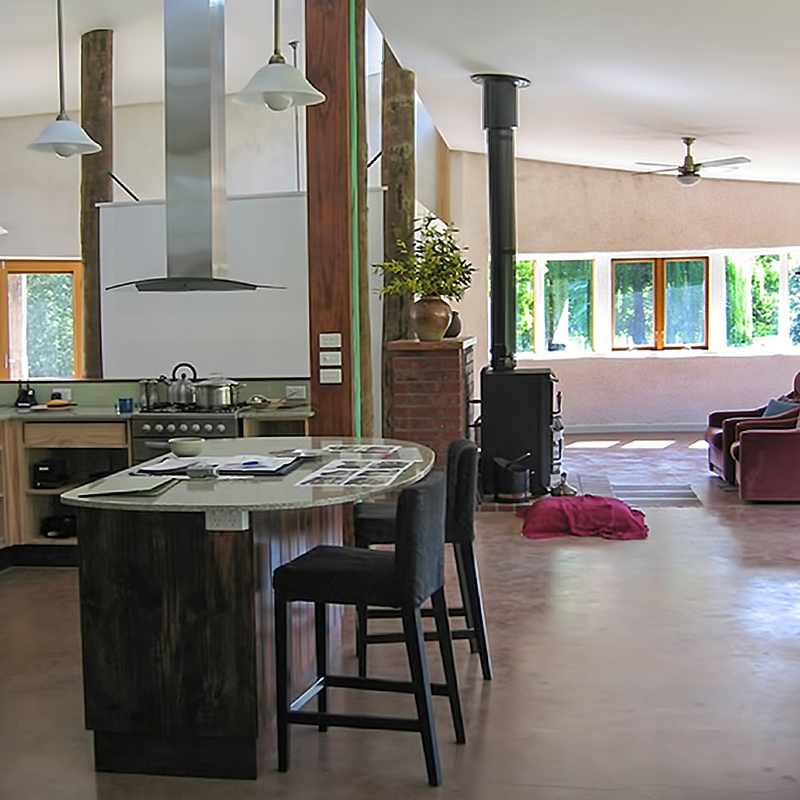 The Mirboo straw bale house experiences comfortable indoor air temperatures all year round. On-site, the existing post and beam house frame structure were modified. 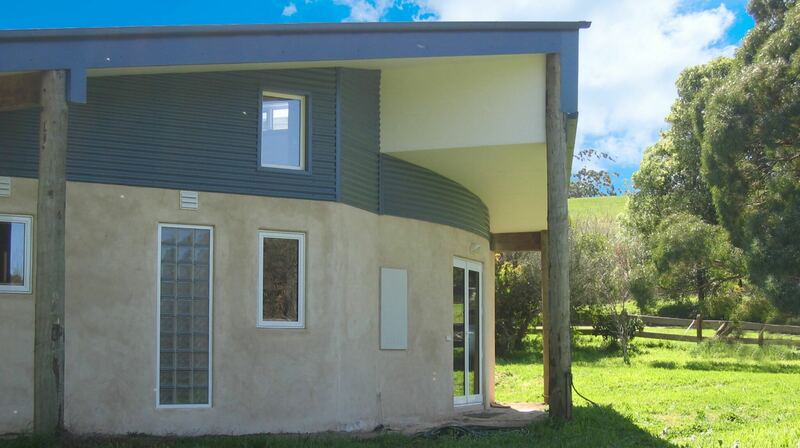 This house frame structure became the structure for the Mirboo Straw Bale House. Infilled straw bales make the external walls. The concept of zero energy buildings is a logical one and easy to understand. The total amount of energy used within the house is equal to or less than the electricity produced in the household. 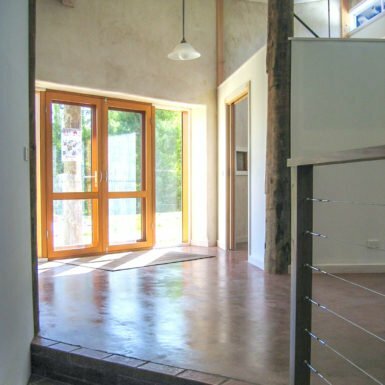 The Clients for the Mirboo straw bale house wanted to retire and live in a zero energy house. And they planned to farm native Australian pepper on their Mirboo property. 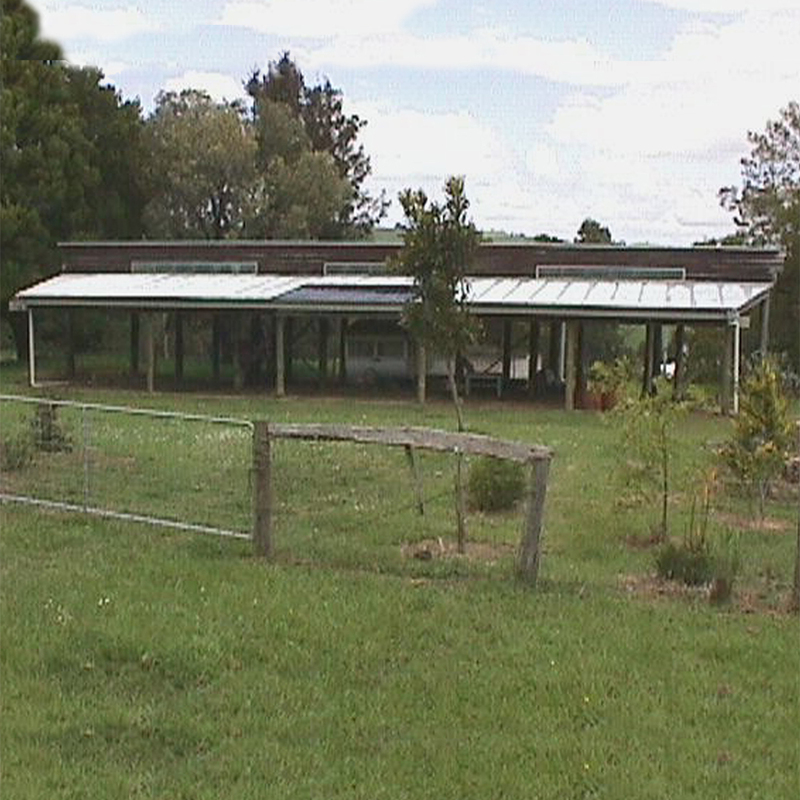 The Mirboo house is an energy efficient building. What this means is that you use less energy in running the household — the house light design allowed for natural daylighting resulting in little electric lighting usage. And in winter the home remains warmed from the winter sun. You require little supplementary heat to make the house warm and cozy over winter. Again, reducing the amount of household energy usage. So a smaller active solar electric system will cover your household energy needs. The passive solar design of the house means that you don’t need any air conditioning. You can keep your home cool by exhausting hot air and the low energy use of ceiling fans. Again, this means you need less energy from your solar electric photovoltaic systems. Passive solar design provides energy efficient solutions. You use less power consumption in a passive solar designed home. Also, your house remains more comfortable without overheating or being too cold. BP Architects specialise in passive solar design and green home design if you want help to make your home more passive solar and energy efficient contact us. Clients wanted a contemporary sustainable home. They planned to change the existing post and beam structure to suit their house design. Changes included the removal of several timber posts. Which still left a lot of columns. The house plan had some of the posts concealed within new brickwork piers. By adding brickwork to the interior of the house, this increased the indoor thermal mass. Some posts were clad in timber to hide electric wiring. The external straw bale wall covered columns within the outer walls. The remaining exposed columns are evident inside the house. There was no floor structure to the existing post and beam structure. So, coloured concrete poured around the current posts formed the new floor slab. The finished floor for the straw bale house is a polished concrete floor slab. 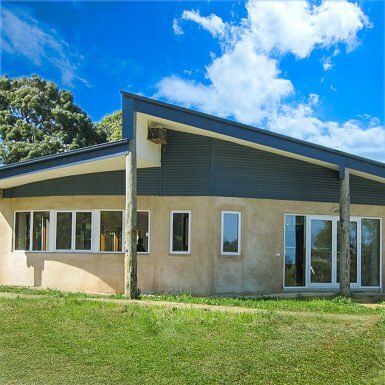 The Mirboo straw bale house is an energy efficient home and designed to be a low maintenance home. 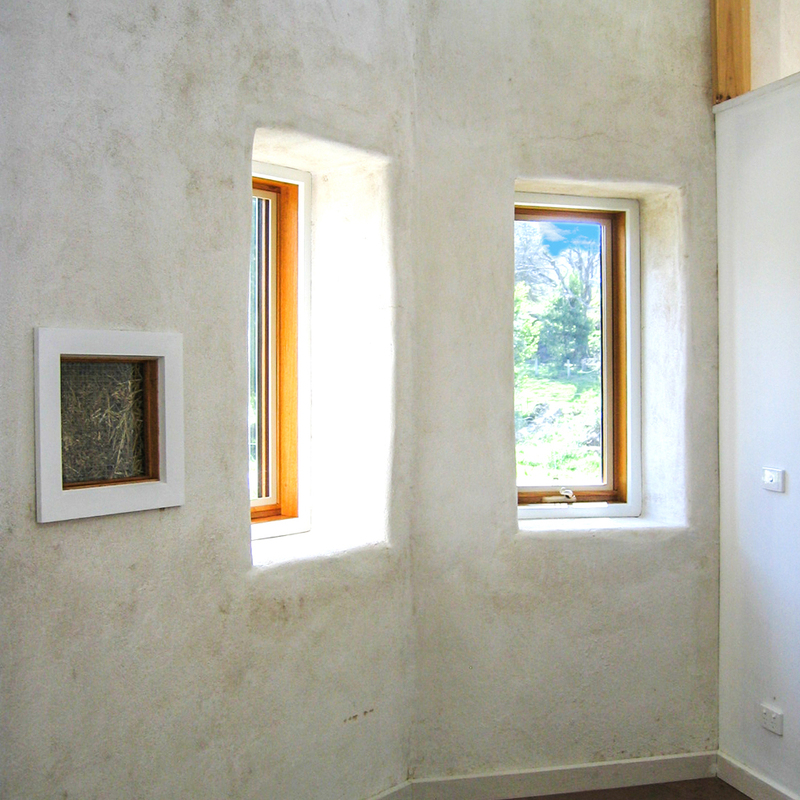 Lime cement render is on the exterior and interior walls of the straw bale house in Mirboo. The chicken wire mesh over the walls reinforces this render. Also on the Mirboo straw bale house, fixed high on the external walls are ‘Colorbond’ sheets. The ‘Colorbond’ cladding eliminated maintenance for these high walls. Wide overhangs of the roof protect the walls. The roof stops further weathering from rain splash and exposure to the elements. Gippsland weather goes from the extremes of cold winters to Hot summers. The design of the Mirboo straw bale home suits both hot and cold weather. Making it a comfortable home to live in all year round. Data loggers installed inside and outside the Mirboo straw bale house recorded air temperatures. The indoor air temperatures ranged between 20° and 25°Celsius. If your indoor air temperatures fall within this range, then this is what considered to be the comfort range for indoor air temperatures. At the same time, the outside temperatures ranged from below 0°C to sweltering summer days exceeding 40°C. 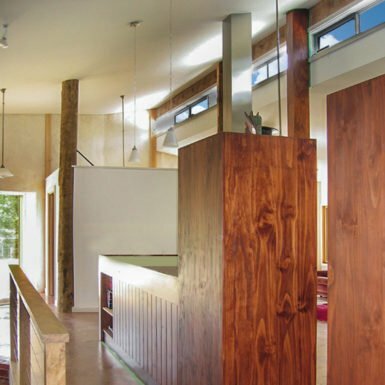 The design of the straw bale house included passive solar design principles. The north facing window wall allowed for thermal heat from the winter sun. Roof eaves shaded the summer sun. 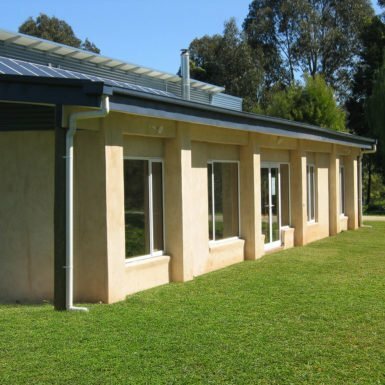 Straw bale external walls provide high levels of insulation with R-values of R4.8 – R5.5. Loose straw filled gaps around the windows and timber frames. By filling in all the holes in the walls, this helped prevent heat loss from the house. Unobstructed interiors and window placement provided clear air flow and cross-ventilation. Opening the High clerestory windows at night allowed for secure nighttime cooling and exhausting of rising hot air. Living areas and the master bedroom featured curved walls. The modular system of straw bales lent itself to constructing curved walls. A mezzanine retreat designed above the utility area and provided a snug fit. This mezzanine floor overlooked the living room. BP Architects are award winning architects. 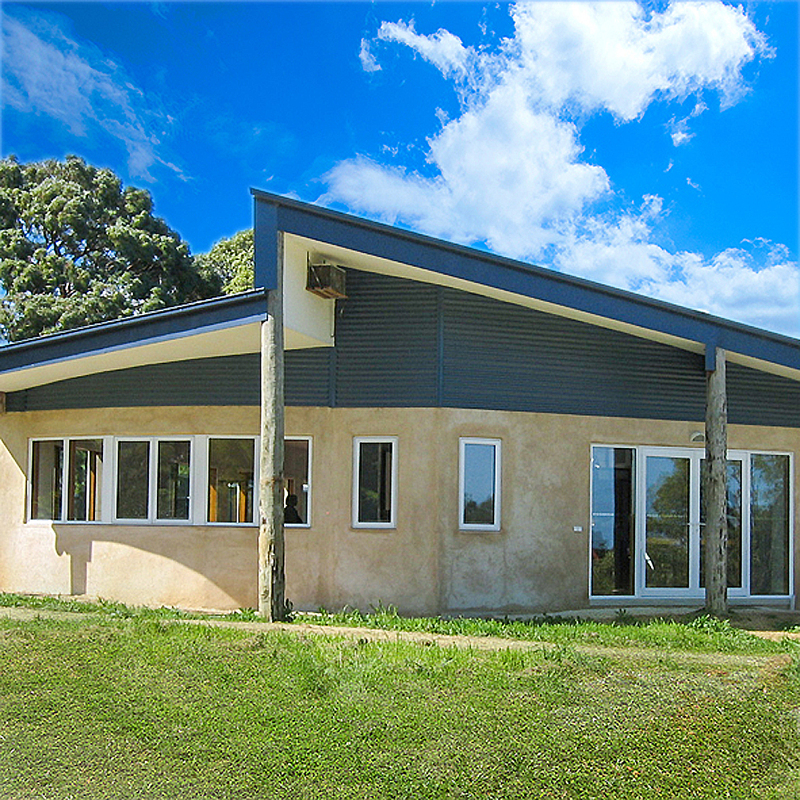 The Mirboo house Highly Commended in the Sustainability Awards, Environ BPN. Windows & glass doors: composite timber & aluminium framed double glazed windows & doors.